My mom always complains that I create a mess when I am at kitchen. Well, as they say “A tidy laboratory means a lazy chemist”. I love to play with different spices and herbs when I am at kitchen, you never know what big new invention can happen. And one such incident happened one day when I was trying my hands with a recipe of lemon chicken that my friend’s husband had shared. I tried this recipe again yesterday for lunch and my whole family loved this finger-licking dish. 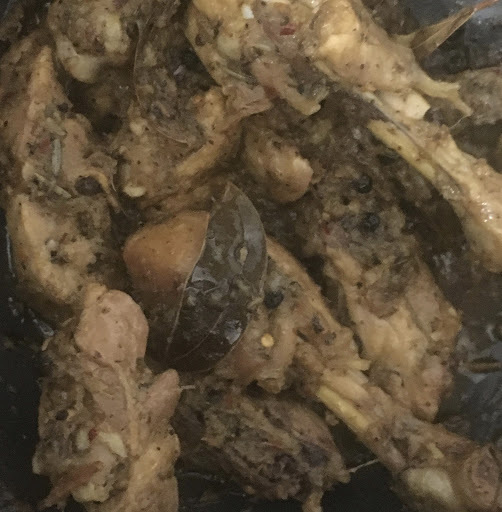 The lemony flavour in this recipe when adds to the herbs and chicken, doesn’t just gives the it a acidity but a succulent flavour.Try this recipe at home and your family if ever doubt your cooking skills, would go gaga over your talent. Take a pan, heat it and add butter and oil to it. Now add sliced ginger,bay leaves and black pepper to the oil, fry the ginger. Add Onion paste and fry it till it gets light brown. Then add the ginger, garlic and green chilli paste and cook it for 5 mins. Add salt and black pepper coarse to the paste. Add lemon zest and all the herbs i.e., rosemary,half of oregano, half of chilli flakes,sage,basil,parsley and lemon juice. Now add chicken and mix it well, Now add red chilli powder and mix again. Put a lid on and cook for 15-20 mins, make sure you give it a stir in between. Now add the remaining oregano and chilli flakes give it a mix and serve.